The UK's chief environment scientist has called for a delay to a policy demanding inclusion of biofuels into fuel at pumps across the UK. Professor Robert Watson said ministers should await the results of their inquiry into biofuels' sustainability. Some scientists think biofuels' carbon benefits may be currently outweighed by negative effects from their production. 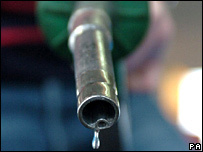 The Renewable Transport Fuels Obligation (RTFO) is to introduce 2.5% biofuels at the pumps from 1 April. Professor Robert Watson warned that it would be insane if the RTFO had the opposite effects of the ones intended. He said biofuels policy in the EU and the UK may have run ahead of the science. His comments in an interview with BBC Radio 4's Today programme appear on the day when a coalition of pressure groups from Oxfam to Greenpeace writes to the Department for Transport (DfT) demanding that the policy be delayed until after the review. Professor Watson does not advise the DfT - and said his thoughts as chief environment scientist on the sustainability of biofuels had not been sought. The DfT is itself under pressure from an EU policy demanding the inclusion of 5% biofuels in road fuels by 2010 in an attempt to cut carbon emissions. It is impossible to say yet whether any biofuels are truly sustainable or not as they are blended on the world market and their origins are impossible to trace. Some scientists believe some biofuels - particularly ethanol from sugar cane - should be seen as sustainable. But others fear the impact of biofuels on food prices. And recent articles from US scientists argue that the carbon debt incurred from carbon released from ploughing virgin soil often outweighed any potential carbon saving from the biofuels. Professor Watson said some of the calculations on soil science were controversial - but agreed that carbon losses from soil were a serious concern. He said that the UK was a leader in exploring the full sustainability implications of biofuels. This is certainly true compared with the US which has set numerical targets for biofuels without consideration of their carbon impact. The great green fuel gamble?